A column of armoured vehicles flying Russian flags drove into a Ukrainian city controlled by pro-Russia insurgents Wednesday, dampening the central government's hopes of re-establishing control over restive eastern Ukraine. Still, it was far from clear just who these mostly masked men were and what their presence meant for eastern Ukraine, which has seen a surge of support for closer ties with Russia and against the new government in Kiev, which wants closer links to Europe. The six vehicles with troops in camouflage sitting atop entered the city of Slovyansk, a hotbed of unrest against Ukraine's interim government. Insurgents in Slovyansk have seized the local police headquarters and the administration building, demanding broader autonomy for their eastern Ukraine region and closer ties with Russia. Their actions have been repeated in at least eight other cities in eastern Ukraine. One of the men said they were Ukrainian soldiers who had defected to the pro-Russian side — which raises the spectre of an uprising by defected Ukrainian forces in Ukraine's eastern regions. But an AP journalist overheard another soldier suggesting that the handover of the vehicles took place under duress. "How was I supposed to behave if I had I had guns pointed at me?" the soldier, who did not identify himself, said to another resident. Further adding to the confusion, a senior Ukrainian lawmaker denied that any defections had taken place and instead insisted the men on the vehicles were Ukrainian soldiers using a false flag to move about freely. The uniform worn by some of the men on the vehicles was different from that of the gunmen on the ground, many of whom had pro-Russian ribbons attached to their shoulders. Eastern Ukraine was the support base for ousted president Viktor Yanukovych, who fled to Russia after months of protests over his decision to back away from closer relations with the European Union and turn toward Russia. Opponents of the government that replaced him allege the new authorities will repress eastern Ukraine's large Russian-speaking population — events which the UN's human rights body says has not happened. Reflecting the West's concern, German Chancellor Angela Merkel called Russian President Vladimir Putin late Tuesday to discuss the situation in Ukraine and preparations for diplomatic talks in Geneva on Thursday. The Kremlin said Putin told Merkel that "the sharp escalation of the conflict places the country in effect on the verge of a civil war." Merkel's office said she and Putin had "different assessments" of the events in Ukraine. In Brussels, NATO announced it was immediately strengthening its military footprint along its eastern border — which often borders Russia — in response to Russia's aggression in Ukraine. NATO Secretary General Anders Fogh Rasmussen said NATO's air policing aircraft will fly more sorties over the Baltic region and allied ships will deploy to the Baltic Sea, the eastern Mediterranean and elsewhere if needed. NATO says Russia has up to 40,000 troops stationed near the border with Ukraine. Western nations and the new government in Kyi fear that unrest in the east will be used by Moscow as a pretext for a military incursion. 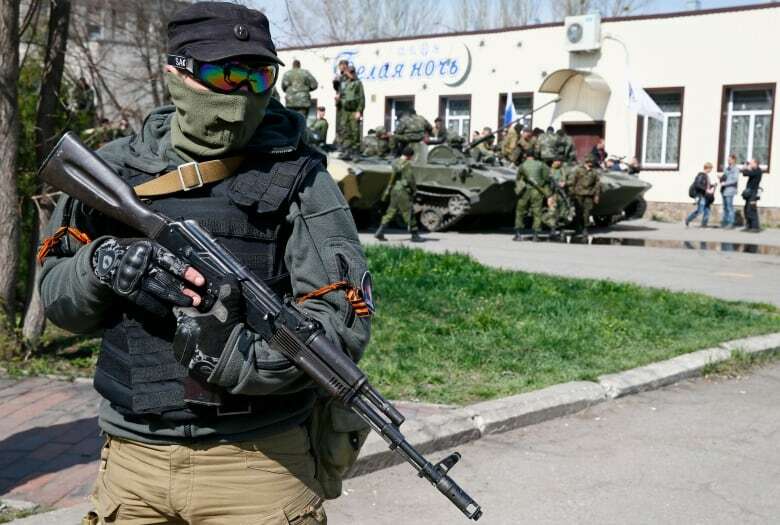 In Slovyansk, a city 160 kilometres from the border with Russia, the armoured vehicles stopped near a government building and flew Russian flags while residents chanted "Good job! Good job!" One of the men on a vehicle, who identified himself only as Andrei, said the unit was part of Ukraine's 25th Brigade of Airborne Forces and that they had switched to the pro-Russian side. "Our bosses made the decision and we obeyed," he said. His statement couldn't be independently confirmed and the Defence Ministry repeatedly declined to comment on the events. At the same time, Serhiy Sobolev, head of a parliamentary faction in the governing coalition, asserted the men were Ukrainian soldiers conducting a false-flag operation. "These are our military units who used the partisan method of infiltration into the facilities that today are controlled by Russian military forces and those separatists who are financed by them," Sobolev said on Ukraine's Channel 5. It was not clear why he would publicly comment on an allegedly covert operation. Some onlookers were happy with the pro-Russian forces. "We will never allow the fascist Kiev authorities to come here," said Andrei Bondar, 32, a Slovyansk resident. But Tetyana Kustova, a 35-year-old sales clerk, was appalled by the unrest. "They are pushing us toward Russia," she said. "They are tearing Ukraine into pieces." Later Wednesday, residents surrounded 14 Ukrainian armored vehicles in the town of Pchyolkino, south of Slovyansk. Dmytro, a Ukrainian solder who only gave his first name, vowed that he would remain loyal to the Ukrainian state. "I took an oath to serve Ukraine," Dmytro said. "I will not betray my oath." In Kyiv, Prime Minister Arseniy Yatsenyuk accused Russia of orchestrating the unrest. "Russia has got a new export now, apart from oil and gas: Russia is now exporting terrorism to Ukraine," Yatsenyuk told a Cabinet meeting. "Russia must withdraw its sabotage groups, condemn terrorists and liberate all administrative buildings." In the eastern regional capital of Donetsk, armed militias seized the mayor's office, demanding that the Kiev government agree to hold a vote on broadening the region's autonomy. "We have come into this building so that Kiev accepts our demands, the demands of the ordinary people of Donbass, to adopt a law on local referendums," said militiaman Alexander Zakharchenko. Russian markets have been rattled by tensions between Moscow and neighboring Ukraine, where Russia annexed the Black Sea region of Crimea last month. The Russian economy slowed sharply in the first three months of the year as spooked investors pulled money out of the country. Russian Economy Minister Alexei Ulyukayev told parliament that growth was only 0.8 per cent in the first quarter — far short of the ministry's earlier prediction of 2.5 per cent — because of "the acute international situation of the past two months" as well as "serious capital flight."